While the demonetisation of Rs 500 and Rs 1,000 notes last November provided a crucial impetus to India’s journey towards a cashless economy, there are signs that adoption of digital payments, after the initial surge, may settle at a lower level. To make this shift sustainable, Micro, Small & Medium Enterprises (MSMEs) are key stakeholders that need to be enabled, according to a report by The Boston Consulting Group (BCG) titled ‘Enabling MSMEs For A Cashless Future’. According to the ministry of MSME, there are about 50 million MSMEs contributing to over a third of India’s GDP. MSMEs also contribute to about 40 percent of India’s exports, 45 percent of its manufacturing output and employ 20 percent of the workforce. More importantly, 55 percent of these enterprises are based in rural areas making MSMEs critical for the Indian rural households. However, BCG’s survey of 1,700 consumers post demonetisation showed that about 22 percent of the respondents intended to use digital payment methods within 6 months compared to 11 percent earlier, whereas a majority of the 50+ MSMEs showed a preference for reverting to cash. MSMEs were also severely impacted compared to large corporate entities during demonetisation, and that the event offered a glimpse into the vulnerability of MSMEs in a cashless ecosystem. The primary reasons for the deeper impact were because their business economics are strongly linked to cash transactions – a combination of lower overheads and tax liabilities or lower input costs due to evasion of indirect taxes has historically been an advantage, and moving to a cashless economy is likely to eliminate many of these advantages. Plus, around 95 percent of the MSME businesses are proprietorships, thereby allowing the income to be clubbed with the proprietor’s personal income, as a result of which average tax rates tend to be lower compared to the 25 to 30 percent tax rates for corporates. The other barriers include higher ease of doing business in cash, no perceived benefit of shifting to cashless and a general lack of awareness. Secondly, there is reduced access to credit. About 75 percent of MSME credit demand is fulfilled by informal sources, which is mainly in cash and at higher rates. The informal sources of funding are likely to reduce in a cashless ecosystem reducing the credit avail¬ability for these enterprises. 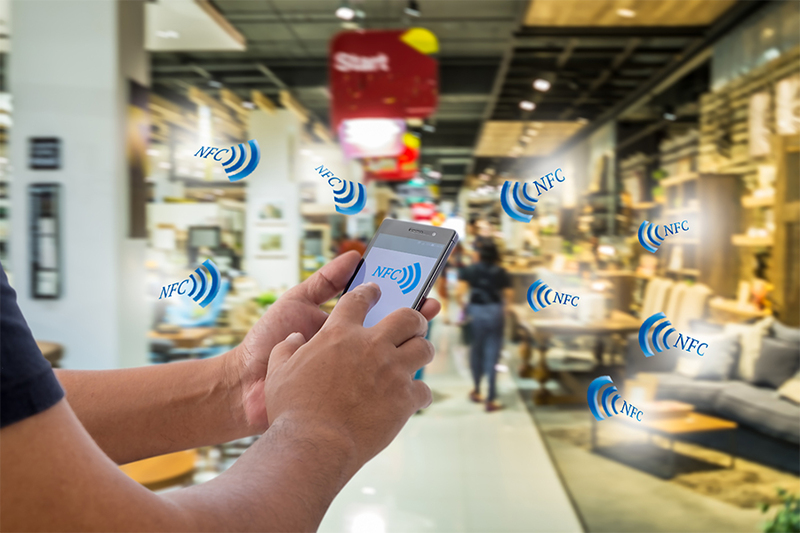 And thirdly, as more and more consumers transact digitally, demand will consequently shift towards organised channels or stores accepting cashless payments. The BCG-CCI 2016 Consumer Survey had found that about 10 percent of consumers shifted from pure-cash kirana stores to stores accepting digital payments post demonetisation. In the next six months, the proportion of consumers intending to switch to cashless payments is likely to double. In contrast, 60 percent of MSMEs would prefer to revert to cash transactions once cash circulation is restored to pre-demonetisation levels. To overcome these barriers, the government has already started creating a push in many of the right areas, which include driving financial inclusion, easing registration requirements and rolling out the UPI-based payments system. 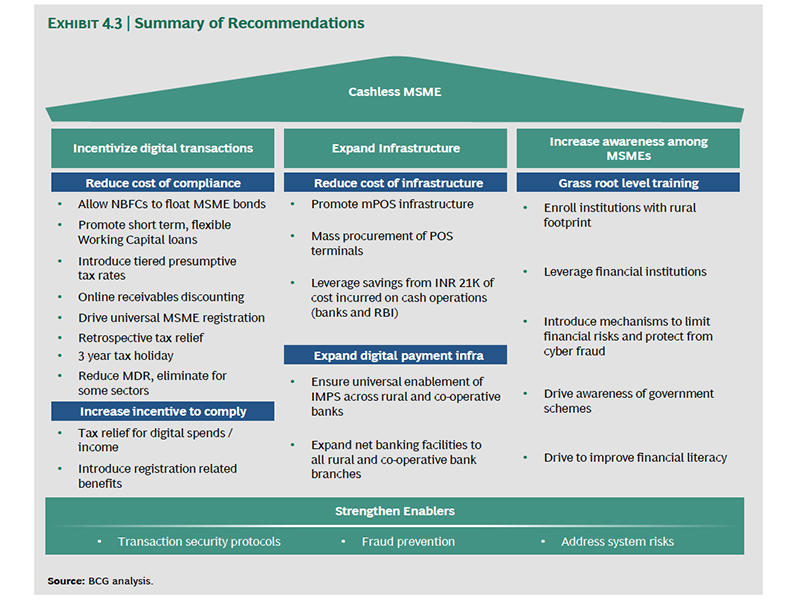 In addition, the report recommends incentivising digital transactions, expanding infrastructure and increasing awareness and strengthening enablers.